One of the tastiest preparations in Japanese cooking is grilled seafood that has been marinated in sakékasu, or saké lees, the yeasty rice solids and precipitates that get left behind after the saké gets pressed out. The kasu is combined with other ingredients to make a paste, which is applied as a marinade on seafood, meat or vegetables. Proteins in particular benefit from the presence of glutamates in sakékasu that impart a wonderful savoriness (umami). While salmon is most commonly associated with this kind of fish preparation, in my book the best fish is black cod. 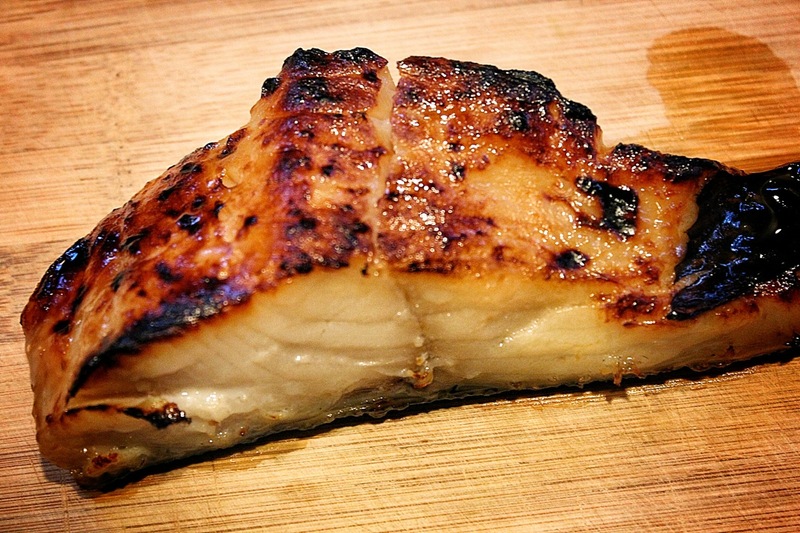 Also known as sablefish or butter fish, black cod has a high enough fat content that it retains its moistness and soft texture when broiled or grilled. Here in Seattle, it’s a very popular dish, served in Japanese restaurants—and even non-Japanese ones, like Ray’s Boathouse. For cooking at home, Uwajimaya has it available year-round, already pre-marinated. For my money though, hands-down the best ready-to-cook version is prepared by Mutual Fish Company, a seafood market that has done quite a bit since the mid-60s to introduce high quality seafood to Seattle and source some of the area’s best restaurants. The kasu cod is so good that my wife takes pounds of it with her to share with her family in Southern California, and everyone there just loves it. Savory and delicately sweet with a seductive aroma, the cod flakes off in exquisitely buttery chunks and melt in the mouth. The complex flavors permeate the entire fillet. At $20 per pound, it’s an infrequent indulgence. When in town, visitors from California have been known to go out of their way to buy Mutual Fish’s cod to take back with them. For additional cost, Mutual will pack seafood for air travel. What’s the secret to their magical marinade? Beyond the usual ingredients of sakékasu, mirin (a sweet saké), sugar and salt, Mutual Fish holds the recipe close to the vest. And so it is again that my wife has taken kasu cod down to California to celebrate her father’s birthday, and everyone will comment once more how delicious it is. This entry was posted in Miscellaneous and tagged kasuzuke black cod, kasuzuke gindara, Mutual Fish Company. Bookmark the permalink.